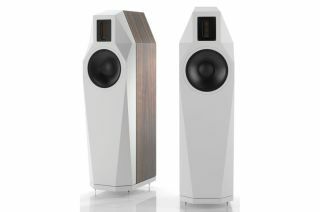 Fink Team launches Borg loudspeaker at Munich High-end Show | What Hi-Fi? Drive units this sort of size (26cm!) are rarely seen in two-way speakers because of their limited high frequency reach. Finkteam's second speaker is a two-way floorstander, featuring a huge 26cm mid/bass unit and specially designed Air Motion Transformer (AMT) tweeter. The driver uses a light, stiff paper cone with a large 75mm voice coil to help power-handling. Engineers have worked hard to refine all aspects of the drive unit, from the surround design through to the motor system. It’s all built into a fully vented die-cast aluminium chassis with the aim of delivering dynamic, low colouration sound coupled with high volume capability. The AMT tweeter is developed and manufactured by Mundorf, with input from Finkteam. The tweeter has a 25µm-thick Kapton diaphragm with 50µm aluminium strips. The aim is for the high frequency unit to have well-controlled resonances and low levels of distortion. Despite being a larger AMT – in order to cope with the limited high frequency reach of such a big mid/bass unit – the tweeter still manages to reach up to 30kHz with low distortion. The crossover frequency is set at 1.6kHz, lower than the typical 2.5kHz or so seen in most two-ways. The crossover is a fourth order acoustic Linkwitz-Riley design, designed to give the Borg an even response. The speakers are intended to be a relatively easy load for an amplifier and have a sensitivity of 87dB/W/m. Finkteam has built a fair bit of adjustability into these speakers, with controls on the rear panel that allow plenty of fine-tuning options. The cabinet uses a sandwich construction, combining multi-thickness layers of MDF and special damping that converts vibrational energy into heat. In-house analysis software was used to optimise cabinet behaviour. The Borg is due to go on sale in July, priced at €24,000 (£21,000) per pair.